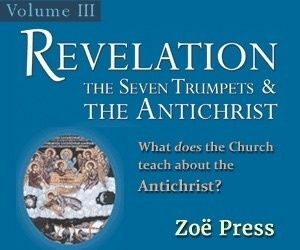 "Do not expect to hear, while interpreting this book, if and when World War III will take place, or when the Antichrist will come, and when the Second Coming of Christ will take place. Please do not expect these things. We need to follow the proven path of our Church. This path, my friends, was mapped out by God-inspired holy Fathers, all of whom wrote theologically sound commentaries on Revelation. Glory be to God, I have commentaries of Saint Andrew of Caesarea, of the sixth century, and Saint Arethas, Archbishop of Caesarea of the ninth century, in my hands, in which one can see the Orthodox teaching of how our Church interprets Revelation. It is not mere coincidence - and we will analyze this more as we continue - that our Church Fathers did not overly occupy themselves with the Revelation. We will see this in our journey. Panayiotis Trembelas, for example, interpreted and published commentaries on all of the books of holy Scripture with the exception of Revelation. Trembelas was a great Greek scholar of the twentieth century. My basic resources include the great commentary of Professor Bratsiotis (the only one of its kind in neo-Hellenic theological literature) along with Saints Andrew and Arethas. These serve as my guides. All the others have some hidden dangers." 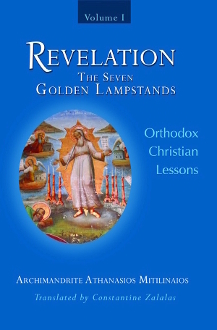 Archimandrite Athanasios goes on to explain how he plans to journey through the Book of Revelation with vigilance and carefulness, rather than letting the imagination go wild, understanding the difficulty of the book. All this shows us that he is interpreting this above all in an Orthodox Christian manner, avoiding all the dangers most commentators fall into when exploring the deep well of this book of Scripture. Having whet my appetite with this most instructive and beneficial first volume, I look forward to exploring the subsequent volumes of this series. This book can be ordered from Zoe Press.